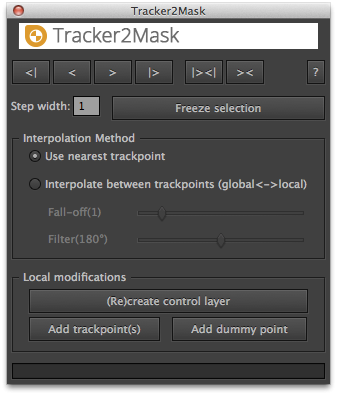 Tracker2Mask calculates the movement of mask shapes based on the motion of trackpoints, and is flexible and easy to use. Importantly, you don't need one trackpoint for each maskpoint. The third step can be interleaved with manual corrections, which leads to a rather fast, assisted rotoscoping workflow. Rotoscope the shape of a moving car based on only four trackpoints; for simpler shapes, one trackpoint is often sufficient. Rotoscope the shape of a moving car based on only four trackpoints, for simpler shapes often one trackpoint is sufficient.